The uses for rice husk are continually growing. Today it is increasingly used as biomass to fuel and co-fuel power plants. There are now many power plants in Asia powered 100% by ground rice husk. 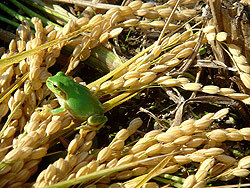 ricehusk.com Pte Ltd. is leading the introduction of rice husk into the EU biomass market. Other uses are in horticulture (soil aeration), animal bedding, and composites (WPC decking, materials & furniture). We supply rice husk ground (GRH) and unground (RH). Several ground particle sizes are available, the most common being 2 & 3mm and below. How much is available & from where? » Are you a rice husk buyer? » Are you a rice husk seller? Please contact us directly to discuss your needs. We are happy to go into more details. Rice husk has a number of names, the most common being husk, hull, and chaff. Rice husk is the outermost layer of protection encasing a rice grain. It is a yellowish colour and has a convex shape. It is slightly larger than a grain of rice, thus lenghts up to 7mm are possible. Typical dimensions are 4mm by 6mm. It is lightweight, having a ground bulk density of 340kg/m3 to 400kg/m3. Rice, maize, and wheat are the 3 most cultivated crops in the world, with rice being the most commonly eaten daily foodstuff for more than 2/3rds of the worlds population. 92% of rice is grown in Asia, the majority in Vietnam and Thailand. In 2013 approximately 5.4 million tonnes of raw husk is available from Vietnam alone. Rice husk is low in density and an unusual shape. This poses storage and transport challenges. Hence why it is usually ground and packed in PP bags, or if in powder format in lined bags (PPL). Bulk loading is possible but un/loading via closed bucket or suction is recommended. Export quality Rice Husk pellets are now available. 180,000MT p.a. There are only three mills globally able to produce genuine export quality RHP in bulk. The first industrial volume rice husk pellet plant came online in 2011. Please see our onsite photos in the product photos page. The only other alternative to to securing volumes above 5MT per month is collection from multiple small mills, which results in a mix of inconsistent and non durable pellets which is not viable for exporting. We supply single source export quality pellets from the main mills only. Standard 8mm pellets. FCL bag loading & bulk loading are possible. If you wish to procure Rice Husk pellets that can be exported and arrive intact/not as dust and meeting the stated specifications contact us. Controlled burning of rice husk produces RHA, which contains a typical minimum of 75% amorphous silica. The norm is 95%. This can be used in cement production as a percentage substitute for ordinary portland cement, and as an insulator to line ladles in steel manufacturing. It is not as simple as burn and you have the right product, there are significant property differences between white and black ash. It requires very specific heat and timing to produce the correct product. Whole rice husk is a popular bedding for animals. Compared to saw dust it is fire resistant, does not attract insects, and it does not pack/compress meaning a softer bed for animals that does not require as much per m2 as saw dust or other types of bedding. The outstanding feature is that rice husk does not absorb liquid or bind up into clumps; urine and feces run through the husk to the lower level of bedding. This keeps the animals dry and makes cleaning easier and faster. As a soft bedding it prevents hock and leg blisters. It provides insulation and once used/removed it makes a good soil compost. We supply whole husk in PP bags as well as in bales. Rice husk is a waste product that farmers previously struggled to dispose of due to it’s large volume. (It’s volume is about 20% of total rice crop.) Today it is a traded commodity with a growing variety of uses. You may have heard that rice husk is free. It can be. At a rice farm hundreds of kilometers from a port, away from roads and rivers, and up a hill. Anywhere else farmers sell it to millers, and millers have to collect it via truck or more typically barge, transport it to mills, clean and grind it, pack it, transport it to port, and load it. The cost of this (transport & energy) forms the majority of the cost. Please contact us for this weeks price.